The Jersey Centre for Separated Families held its Annual General Meeting on Tuesday the 30th of September 2014 and they are delighted to announce that Karen Woodall is the new chairperson. “This is exciting as we have been working together for the last two years to offer parents access to the very best support and advice, by ensuring all our volunteers, including those who operate Milli’s Child Contact Centre, have undertaken specialist training in family breakdown and how to work and support families. This means that families in Jersey have access to a truly independent professional family breakdown support services which can only be good for the children and the community." 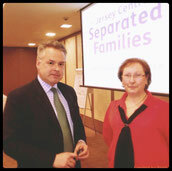 Karen and Nick Woodall will run regular surgeries and training on Jersey and the Jersey Centre for Separated Families offers access to all of the specialised services available at the Family Separation Clinic in London which is the first dedicated clinic of its kind in the UK. Karen Woodall is the author of several publications on children and families and has written for the Joseph Rowntree Foundation on separated parents and isolation and for Oxfam on Gender Analysis. She is a therapist; parenting co-ordinator; writer on family separation issues; gender specialist and has a special interest in developing services for families that meet the needs of everyone as they go through change. She is the lead therapist of parental alienation at the Family Separation Clinic in London and specialises in working with high conflict separated families and children who are resistant to relationships with a parent after family separation, author and researcher on parental alienation and the impact on children of high conflict divorce and develops treatment routes for families affected by parental alienation. Listen to our new Chair, Karen Woodall, being interviewed on BBC Radio Jersey. Listen to one of our service users talking about her experiences on BBC Radio Jersey.